In the Middle Ages all the grain grown in Sutton was ground at the manorial corn mill which stood at the bottom off Mill Street. This mill was damaged by a flood in 1668, and was eventually converted into a skinning mill where hides were cleaned before being tanned and made into leather. This business closed in the 1850s, leaving the property empty for a time; the deserted millers house and cottage proved useful in 1861 when a gang 63 railway navvies working on the Sutton branch railway had to be found accommodation in the town. The 1861 census shows that an Irish bricklayer, Thomas McKnight, was living in the millers house with his wife and infant son, together with seventeen lodgers, all of them Irishmen, described as “railway excavators”. Margaret Dickens, a dressmaker, lived in the cottage next door with her son George, a 19-year-old plasterer; her two lodgers were also excavators. These buildings, which lay below the level of Lower Parade (then known as The Dam) next to the deserted pools, drying grounds, tanhouse and sheds of the old leather mill, were no doubt dilapidated, damp and smelly. Better houses lined the Dam itself (all demolished long ago). The oldest of these, the timber-framed Yew Tree Cottage, stood by itself in the middle of what is now South Parade; it had once housed a wheelwrights shop, but in 1861 a shoemaker’s widow lived there with her family. Then came a row of four artisans houses, all given a “gross estimated value” of £7.10s.0d, compared with the £5.7s.0d. of the larger but tumbledown Yew Tree Cottage. Further on, James Pimlott was the landlord of the Coach and Horses Inn, valued at £28. 2s. 0d, a larger three-storey building with Pimlottt’s small farmyard at the back. 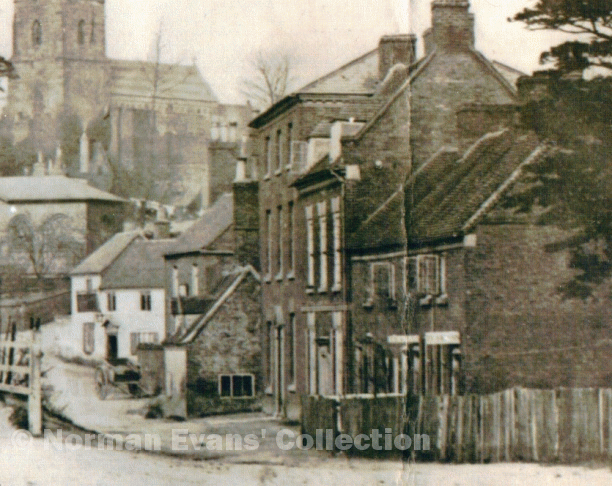 Elizabeth and William Lynall, his niece and nephew from Shifnal in Shropshire, worked for their uncle at the inn. Three more houses completed the row, the first a single-storey cottage occupied by Peter Pimlott the shoemaker. Next there was a wide roadway giving access to the mill, with three houses fronting it. Here lived John Fernyhough, a sixty-year-old blacksmith whose forge was over the road at the bottom of Mill Street, and two labourers, Joseph Shaw and Joseph Ludford, with their families. These houses were originally built for mill workers, valued at only £5. 8s., and now, 1861, owned by James Hollis, who also owned the house on the corner fronting Lower Parade where his son Thomas lived. Thomas was a corn dealer and his wife Myra ran a grocer’s shop at the house, which was valued at £10. 16s. 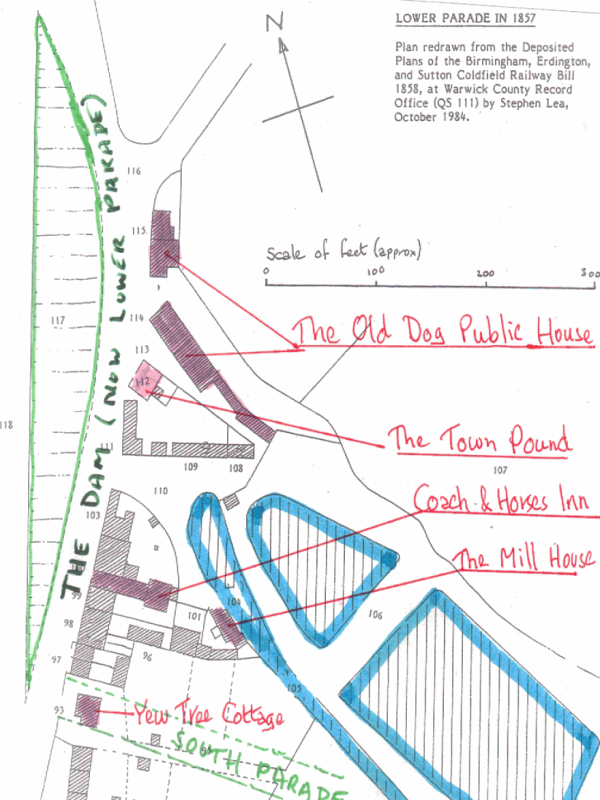 The town pound, where stray animals would be housed by the Town Impounder until claimed by their owner, lay between Hollis’s house and the next building, the Old Dog Inn. Described as “The Old Dog public house, stabling, outbuildings, yard, garden and bowling alley”, it had stabling for at least eight horses, a cart house and a smith’s workshop. George Ryman was the owner and occupier, born in 1805 at Great Tew in Oxfordshire; his grown-up son and daughter assisted in the public house - Ryman described himself as a licensed victualler and farmer. This was valued at £26, not so highly as the Coach and Horses. The last house on the dam was treated as part of the Old Dog; Ryman’s 20-year old daughter lived here and kept a grocer’s shop. Map of Lower Parade as it was in 1857. Lower Parade c.1870, showing a miscellaneous group of buildings, no two alike.